“How can I grow spiritually?” That question, in 1979, by St. James’ own Eleanor Pierson to her Rector Father Kenneth Gluckow, was the seed for the establishment of the Bradley Food Pantry. After completing a two year course at the National Institute for Lay Training, as recommended by the Rector, Eleanor then wanted to know how her training could bear fruit. Noting the increasing number of emergency requests for food, Father Gluckow observed that it would be easier and quicker to respond to such requests if there were to be a reserve supply of food on hand. 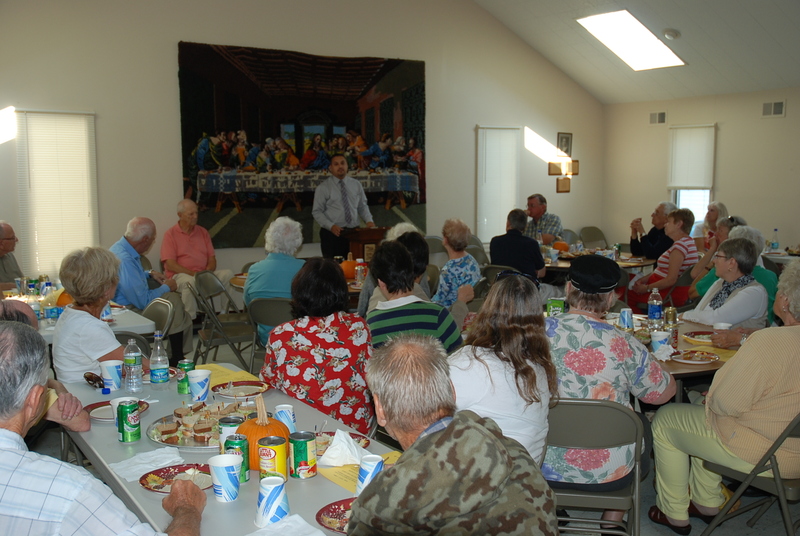 In addition, he noted, St. James Church would be responding to Christ’s call to feed the hungry in our midst. 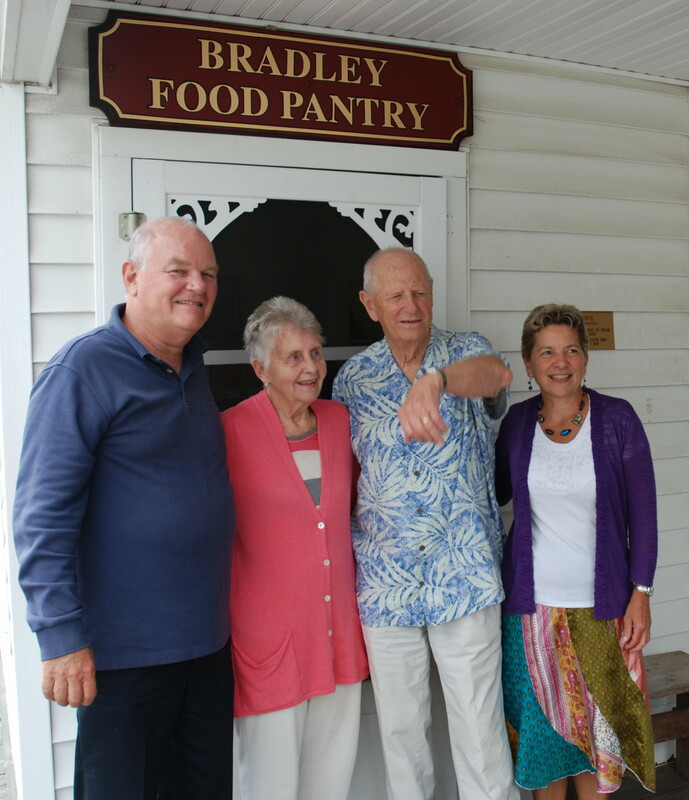 On October 7th 1982, the Bradley Food Pantry opened for operations in the Office building of St. James Church, under the joint auspices of St. James Episcopal Church and the United Methodist Church of Bradley Beach. 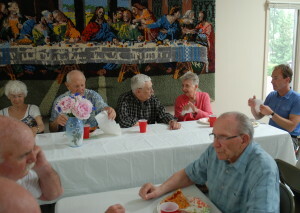 The Pantry was housed in the kitchen of what had been the church rectory; bulk supplies were stored in the basement of the building. 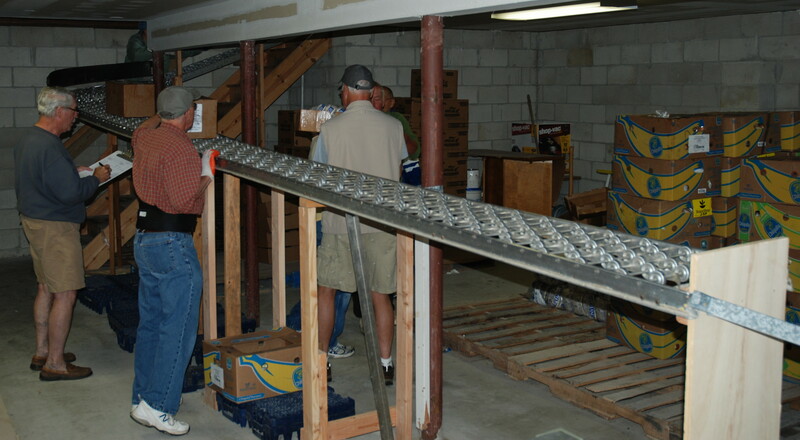 Shelves were installed and painted, and the Pantry was readied for operation by members of St. Martha’s Guild and the Vestry of St. James Church. 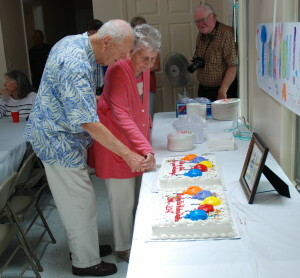 Eleanor Pierson of St. James and Lauretta Conwell of United Methodist served as the first Coordinators for the Pantry. From the beginning, and continuing to this day, the commitment of the Pantry has been “to serve our neighbors in need, once a month, with emergency food for three days, with kindness, respect, and dignity for all clients”. 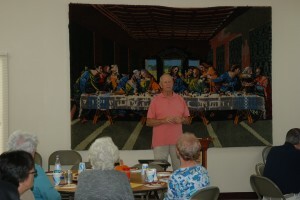 During the three months of 1982, the food to stock the pantry shelves was obtained through cash donations and two in-gatherings of food held by St. James and one held by United Methodist. 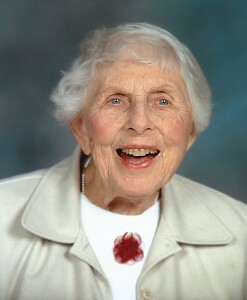 Eleanor Pierson devoted many hours to the preparation of Requests for Grants to acquire food and other supplies needed to run the Food Pantry effectively. 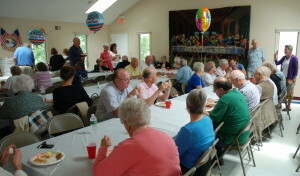 That same year, a St. James Country Fair raffle prize of $300.00 in Foodtown certificates was won by a St. James parishioner (Christy Polycandriotis), who donated the prize to the Bradley Food Pantry enabling the purchase of Thanksgiving turkeys and Christmas hams for inclusion in holiday baskets. 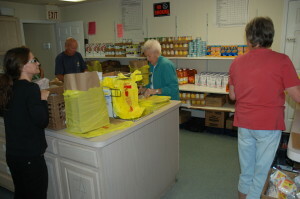 During the first year, the Food Pantry was open on Tuesday and Friday mornings; twenty-five volunteers worked on a rotating schedule. Emergency calls for help on the other days were answered by the Food Pantry Coordinators, Father Glukow or Jane Moore the Parish secretary. More than forty calls for food and clothing were answered in those three months of 1982. 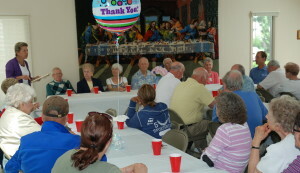 In 1983, Ascension Roman Catholic Church of Bradley Beach became a supporting church for the Pantry. 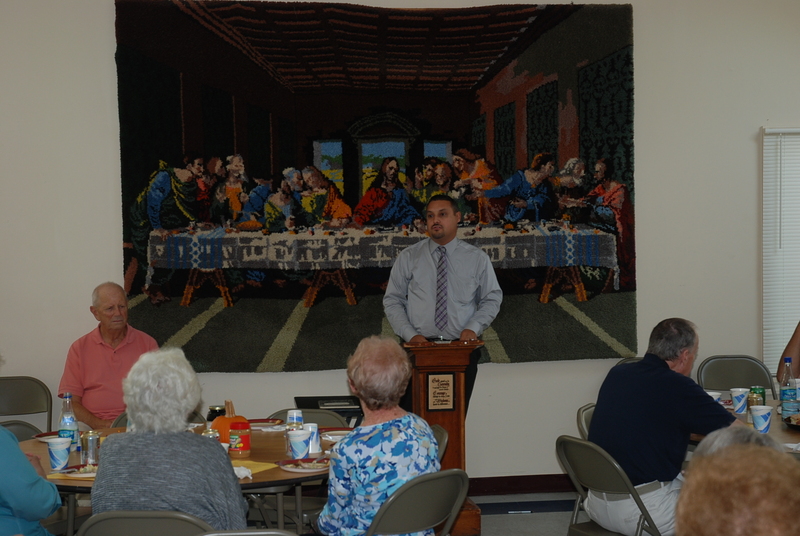 The Pantry also participated in a Monmouth County Emergency Pantry Action Committee that was established to administer monies given to the County by the Federal Government for food and housing, provided through volunteer agencies. 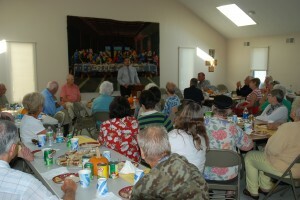 A sum of $75,000.00 was allotted for food to be made available without charge to the local food pantries and kitchens. This source for food was supplemented by the supporting churches, which continued to supply additional food products on a rotating monthly basis. 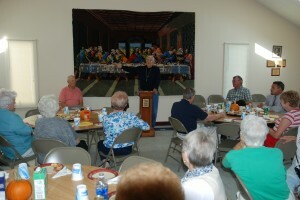 In 1984, the Food Pantry took advantage of a distribution of butter and meat by the government. 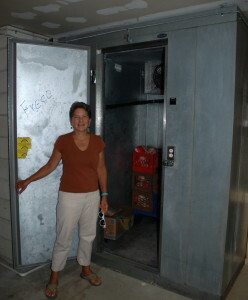 In addition, thanks to a grant from the Hunger Task Force of the Diocese, the Pantry was able to obtain an upright freezer which was housed in the garage. Monetary gifts and food donations from Bradley Beach community organizations, the Shore Council of Churches, private sources and the three supporting churches enabled the Bradley Food Pantry to continue its operations. Christmas gifts were supplied that year by the Asbury Park Junior Women’s Club. During 1984, 972 calls for emergency food were satisfied by the Pantry, thanks to the work of 40 volunteers. In 1985, the Pantry opening was extended to five days per week to serve the food and clothing needs of an increasing number of clients. In 1989, the Pantry received a new freezer from the Boniface Food Center of Spring Lake, a part of the Community Food Center of Newark. Due to severe economic conditions, the number of calls for emergency food from the Pantry in 1991 grew to 5,794, and the continued ability of the Food Pantry to serve the needs of clients was seriously threatened. That crisis was averted thanks to a donation of $1,500.00 from St. James Church. In 1992, West Grove Methodist Church of Neptune, after having conducted food in-gatherings for a number of years, formally became the fourth supporting church for the Bradley Food Pantry. On January 1st 1993, after having served as the first Director of the Food Pantry for over ten years, Eleanor Pierson stepped down from that post and Helen MacAllister from Ascension Church agreed to serve as the Acting Director. Inez Lee became the Coordinator for St. James, and Eleanor Pierson continued to support the Pantry by serving as a scheduler for the work of the volunteers. 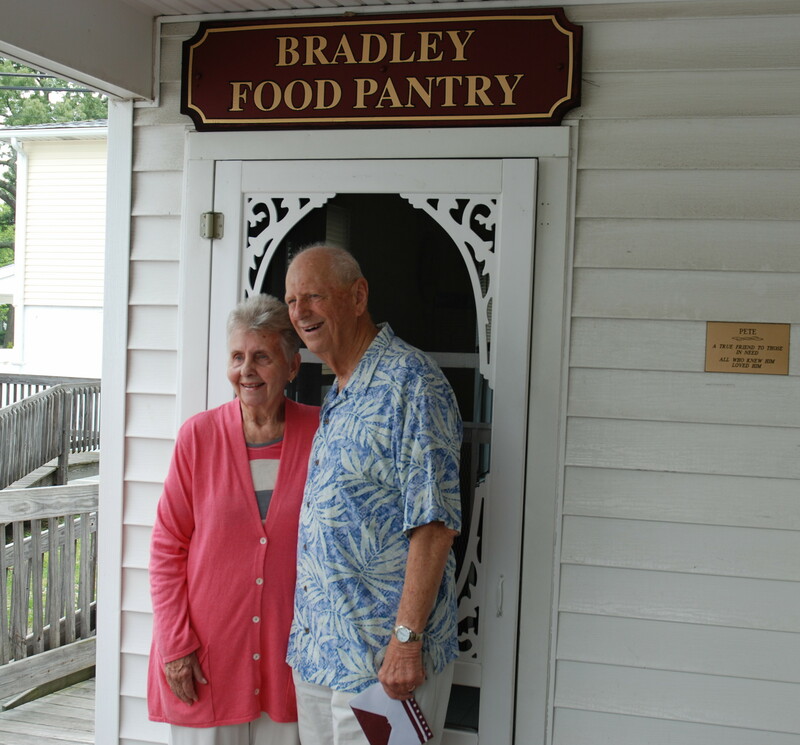 In 1993, the Bradley Food Pantry was incorporated, and received a State Tax ID number and a Federal tax exempt number; in addition, a Committee was formed to consider potential means for institutionally raising the annual operating funds required by the Food Pantry. Eleanor Pierson, who was born on September 19th, 1914, continued to serve as the inspirational leader of the Bradley Food Pantry until her passing from this earth, at the golden age of 100 years, on December 12th, 2014. 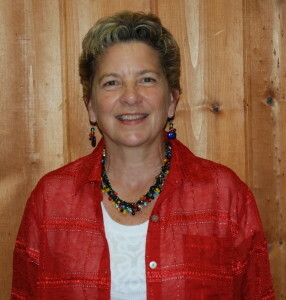 She will be missed by all who knew her. 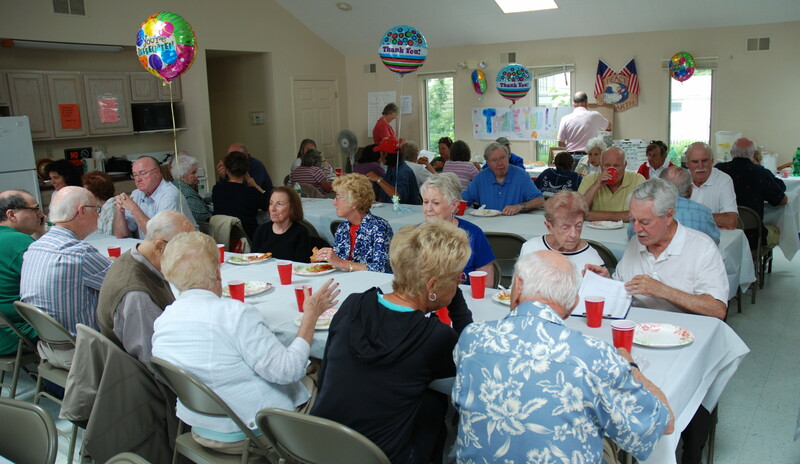 The Outreach Center is intended to provide both a meeting place for the various outreach programs supported by St. James and a proper home for the Bradley Food Pantry. After raising the required funding and completing the architectural plans, the proposed Site Plan for the St. James Outreach Center, and the descriptions of the required associated variances, were submitted to the Bradley Beach Planning Board on November 15th 1995. After four public hearings and planning board discussions, the Site Plan and associated variances were approved by the Planning Board on June 6th 1996, and memorialized on July 15th 1996. The necessary Building Permits were obtained on October 22nd 1997; construction, which included a handicap ramp for access to the building, was successfully completed in July 1998. 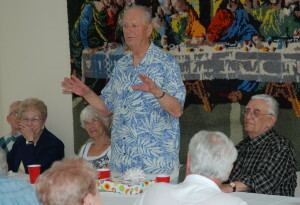 The Outreach Center which is located behind the current Church Office, was constructed under the direction of Ron Humer – then a Warden of St. James Church and a professional in the construction business. Through his efforts, St. James Church was able to secure good prices for the required building materials and the subcontractor work needed to complete the various aspects of the construction. Mr. Humer also was able to obtain a donation of shelving for food storage in the basement of the Pantry from a local supermarket. Mr. Humer’s foresight and vision of the future operations of the Food Pantry also led him to identify the need for construction of a separate entrance to the basement to enable food products to be moved efficiently into the Pantry for storage prior to distribution. A top-of-the-linedumb-waiter, donated by the McCrane Foundation, was included in the basic construction of the Outreach Center to facilitate movement of food products from the storage area in the basement to the distribution area on the main level – a capability very much appreciated by the volunteers! After almost twenty (20) years of service, Mr. Richard Brugger made the decision to resign from his position as Director of the Bradley Food Pantry. 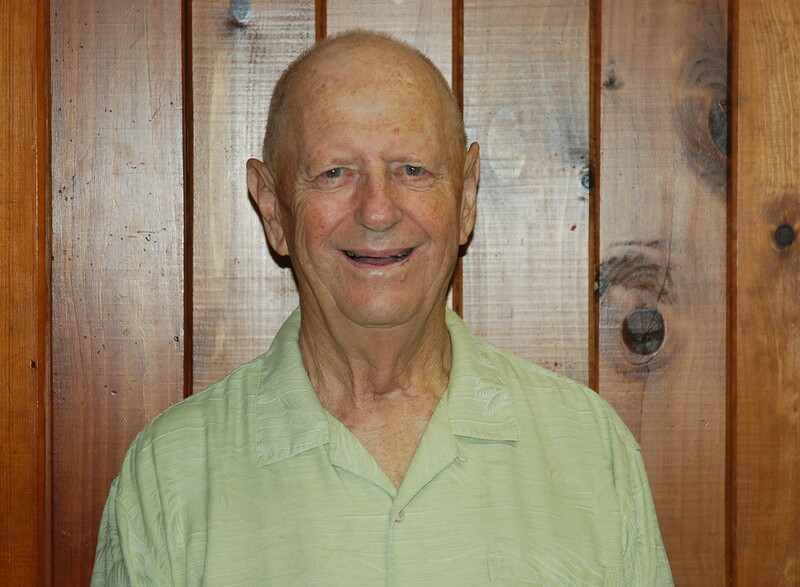 During the time he served in that capacity, Mr. Brugger gained the respect and admiration of the neighboring communities, clients served, and supporting volunteers by skillfully guiding the operations and continued development of the programs of the Bradley Food Pantry. Despite the inevitable difficulties faced during the day-to-day operations of the Pantry, Rich and his wife Mary Ann always maintained a pleasant and confident demeanor, and clearly demonstrated their firm commitment to fulfilling the Pantry’s mission: “to serve our neighbors in need, once a month, with emergency food for three days, with kindness, respect, and dignity for all clients.” Although Rich is no longer its Director, he continues his dedicated support for the Pantry by assisting the new Director Mrs. Linda Curtiss, who was appointed Director with effect from May 1st 2014, as she resolves the operational issues that arise, and also by continuing to contribute various volunteer services which enable the Pantry to successfully accomplish its mission. Mrs. Curtiss of St. James Church in Bradley Beach, and her husband Geoff, had served as volunteers at the Pantry prior to Mrs. Curtiss’ acceptance of the new responsibilities as Director of the Bradley Food Pantry. In August 2015, thanks to the efforts of Mrs. Curtiss in her capacity as Director of the Food Pantry, a walk-in freezer was procured and installed in the basement of the Outreach Center. This additional and crucial capability will enable the Food Pantry to more effectively and more efficiently serve the needs of the Food Pantry clients. 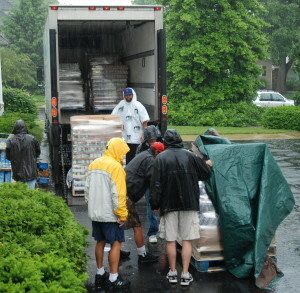 Donations by United Way of Monmouth County and the NJ Natural Gas Company. Distribution of Christmas Toys for children of Food Pantry clients; this program is administered by Jane Moore with the assistance of the St. Martha’s Guild of St. James Church. 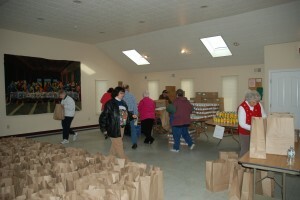 The Food Pantry Program operates effectively and efficiently under the guidance and direction of a Steering Committee comprising representatives from all four supporting churches; namely, St. James Episcopal Church, United Methodist Church, and Ascension Roman Catholic Church all of Bradley Beach, and the West Grove Methodist Church of Neptune Township. 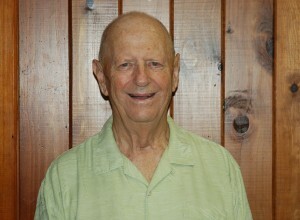 Congratulations to Ronny Lamo, a Parishioner of St. James who completed his Eagle Scout Service Project in April. Ronny worked with the Bradley Food Pantry for over a year, planning and executing his vision to deliver bicycles to those in need. He collected over 30 bikes from neighbors and friends, refurbished them, identified Pantry clients who would benefit from them, and delivered them on Saturday, April 2nd 2016. 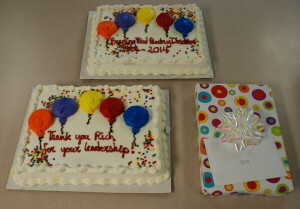 Kudos to Ronny for such a wonderful project and a terrific service to our Pantry community. Preparations for Distribution of Christmas Toys to Children of Food Pantry Clients Toys contributed by Parishioners of St. James Church and the U.S. Marine Corps’ “Toys for Tots” Program. 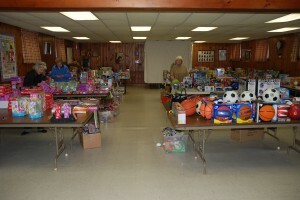 The Toys are organized for distribution, under the direction of Mrs. Jane Moore, with help from the ladies of St. Martha’s Guild of St. James Church. The Children of Food Pantry Clients receive their Toys when their Parents receive their Turkeys, and other Christmas Dinner ingredients, from the Food Pantry.